Folks...I have acquired a a nearly -new American Western Arms 1873 .."Longhorn" (just slightly post -Colt lawsuit, 1999) It is a fine pc..for the price i got it for and certainly no collector. I can shoot it with no regrets. Two issues are present. First, the front sight has been bent to the left, apparently to regulate the POI due to what appears to be a barrel just slightly over tightened to the right. The pistol actually shoots well L/R at SASS ranges, so it is mostly a cosmetic issue that just bugs me! But the actual issue is the narrow , more period sight and the very small rear notch. These are much narrower that my other pistol. I have a a Taylor Cattleman .45 When shooting, the transition from #1 to # 2 pistol is dramatic. The question is should I try and find a smith with the skills to re-clock the BBL, replace the FS with a wider one and widen the rear notch? Or is this a fools errand to chase this rather than just getting a 2nd Taylor? I know "anything CAN be done...but SHOULD it be done?! Advice from the experts,please! All three things you mentioned are easy to do and should be within the abilities of any gunsmith. Thank you...Now I live in the vast wasteland north of the wall...that is, 300 miles north of New York City! Anyone have some favorite 'Smiths that enjoy dealing with these particular revolvers? Turning the barrel a few degrees to the right is very simple and usually doesn’t involve removing material from the chamber end of the barrel. The old bent front sight can probably be removed by grabbing it with vice grips and trying to bend it back. The back sight can be opened up to about .140” to .150” with a milling machine (easy way) or with a jewelers file (a little harder). 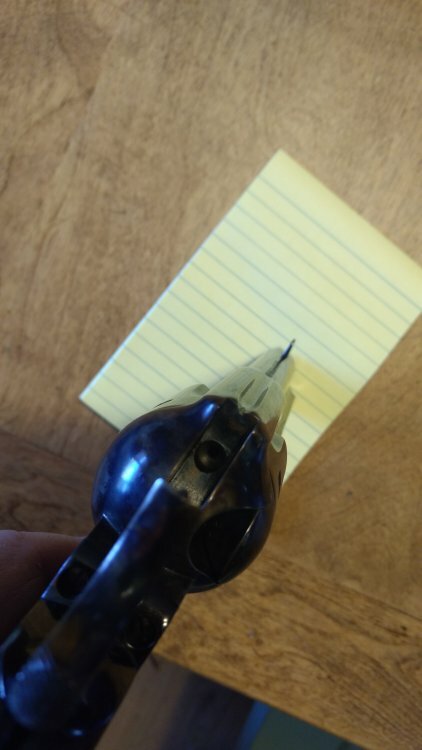 I have done this to several of my guns over the years with no problems at all. If you wanted to set the barrel back a turn it would be a lot more involved, more like Goody mentioned. If the front sight bends back straight, you can get one of the brass front sights designed to be epoxied to the existing front sight. None of this is difficult and the capabilities of many do-it-yourselves and certainly any gunsmith. Around here I’ guess it would probably be less than a hundred bucks.